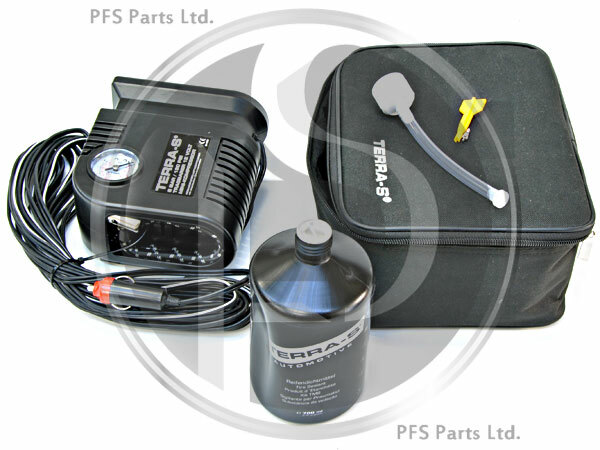 Supplied in the handsome oil and water resistant case is everything you require to repair small punctures in car tyres. 12 Volt 8 Bar/120 PSI Air Compressor. 700 ml of tyre sealant and filling nozzle. Spare tyre valve, and valve removal tool. The compressor simply connects the cars 12 volt socket, and carries a 2 year warranty. The tyre sealant is a special latex substance that is suitable for use in temperatures between -30 and +70 degrees Celsius. This special formula also has cleaning additives that allow the wheel to be easily cleaned once the tyre is removed. Daimler-Chrysler, VOLVO, GM, Opel, VW (Group), BMW, Porsche, Citroen, Peugeot And Honda. This kit is supplied with full operating instructions.